Appreciation to you for your visit to Tallahassee Mother's Day Weekend 2012. You are a generous, exciting & invigorating spirit of unboundful talent. Thank you also for reading from your bullying poetry. The visit is a great gift to our community. Wish you had been " Coming to Tallahassee Road." Happiness Always to you, Birdie & Your Family. Jill M. McMillan, Senior at the University of Southern Maine in Portland Q: If you have a moment to respond, and you wouldn't mind telling me about three aspects that influence your (e.g. Childhood influences, Faith, Cultural Influences). In my opinion the three I listed seem to be the focus of most of your stories and illustrations, but why? Faith Ringgold A: I became an artist in the tumultuous 1960s. However difficult the times I was dedicated to tell my story and in love with being an artist. By the early 1970s I had developed both vision and voice as a black woman artist in America. I went to West Africa in the 1970s and returned home inspired to write my memoir. We Flew Over the Bridge: The Memoirs of Faith Ringgold was published in 1995 it took me fifteen years to get it published. During that time I wrote and painted story quilts and began to create masked performances to tell my story. I had been working in collaboration with my mother, Mme Willi Posey a dressmaker and fashion designer. We made our first quilt in 1980. News of the great jazz saxophonist, Sonny Rollins, a childhood friend, blowing his horn on the Manhattan bridge so that he would not disturb his neighbors, inspired the painted story quilt, Tar Beach. That story of Cassie Louise Lightfoot flying over the George Washington Bridge became my first children's book. I have published 14 children's books to date. 1990 found me in France painting the French Collection and writing the story of Willia Marie Simone, a self styled African American woman artist who went to Paris to be an artist in 1920 during the Harlem Renaissance. The American Collection came next and the story quilts and children's books continued to document my artistic production. In 1992 my husband, Birdie, and I moved from Harlem to Jones Road in Englewood, New Jersey to build a studio. However, our white neighbors (unsuccessfully) sought to deny us the freedom to live there. Freedom, you know, is not free--It took me six years to realize my dream of a beautiful studio surrounded by a beautiful garden. Inspiring images of my ancestors on the Underground Railroad now appeared in my new landscape paintings of Coming to Jones Road Under a Blood Red Sky. Icons of black men and women making the music the whole world loves, the music we brought to America along with the pain of slavery was now a new inspiration. " Mama Can Sing" and "Papa Can Blow" are the ever reassuring realities of black life I depend on during difficult times. Recent work includes Our Ancestors: stories about the worlds children who faced with life in a world at war have forgotten how to play. We call upon our ancestors who would surely bring love and happiness into their lives? Where would we have been without them? It is 2007 and I have just completed a series of 8 serigraphs for publication of Martin Luther King's Letter From Birmingham City Jail , in which he masterfully details our struggle for freedom for which he paid with his life. The 1960s, the majestic words of freedom and peaceful solutions to The Struggle in America are all quite unimaginable without the presence of Martin Luther King Jr. A tribute I feel honored to create. I just saw your work at the National Portrait Gallery and am SO appreciative of your talent. Thank you for sharing it with us. 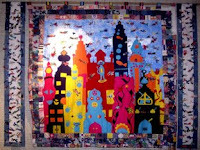 You are an inspiration as an artist and a quilter! Would love to see more of your work in California! I have featured Faith in two of my 20 books on art for children. I'm considering putting her in my third: Great American Artists for Kids. But I need a new art idea...I've used story quilts and tankas already. What next? Maybe painting with acrylics on fabric. Whatever it will be, Faith is one of my favorites, and the favorites of many teachers who know both sides of her work: children's books and serious art. If you have an idea for what art style or technique I could use without repeating the other two I’ve already used, I’m sure I could put Faith in my newest book. I‘m just finishing up the writing now. Any ideas?? ?